Over the years I’ve learned a lot from Lynda.com training. This time it’s different. This time it’s changed how I see art altogether. Before & After: Things Every Designer Should Know by John McWade. It took me years taking pictures to realize that making beautiful photography boils done to how best to tell the story in one frame. This message was well-known to me, I just had no idea it applied outside of photography. In a Lynda.com series recently released called, Before & After: Things Every Designer Should Know, John McWade used example after example to show how composition, layout, color, and shape all are used in graphic design to tell a story. If you remove the distracting extra details on the page the story is more easily told. Nothing is safe from this look. The free video on that link shows an extreme example of that. A whole page of text gets changed to one picture and a couple of words. Using strong shapes can really takes away from what you are trying to say. This can happen by accident as elements on your graphics interact with the background or the border. Using free-floating graphics and space in your lettering can prevent this. Fonts can be used to tell a story. The main concept has more contrast with he background. The shape and weight of the text correlates to the subject. If light and airy use a thin font and vice versa. Blank space on the page is ok, it can move the eye. Use it to draw the eye to the story. 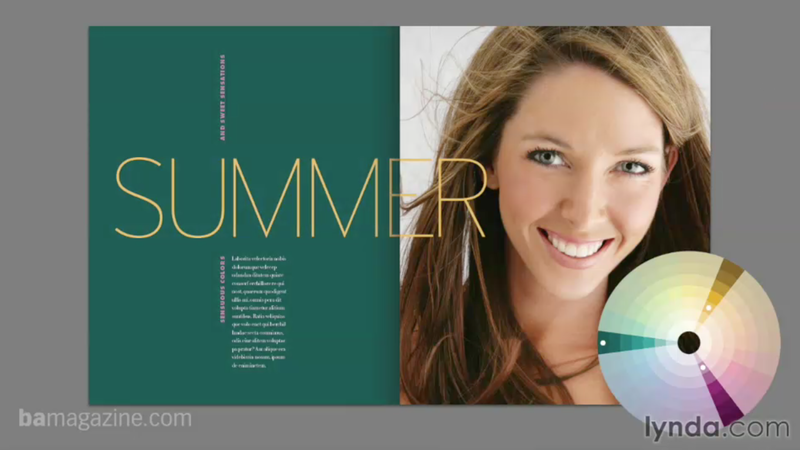 Color can be pulled off a picture and used as a layout for the page. There are a few rules about which colors go well with each other. They are simple and easy to remember. Using a color wheel you can use adjacent colors, colors 180 away, or 120 degrees away. Some of this is explained in the Color portion of my learning pages. The bottom line is you really need to sign up for Lynda.com and watch these short series. It will change your view of design.View this entire Before & After: Things Every Designer Should Know course and more in the lynda.com library.